Ohrid is a city in south-western part and also, a leading summer tourist center in the Republic of Macedonia. Ohrid is located on the shore of the Lake Ohrid, some on 171 km from Skopje, while from the nearby Struga, is just 15 km away, from Bitola 66 km, from Resen 35 and from Kicevo 61 km away. Some 9 km from the city, on the Ohrid-Kicevo road can be seen, the second airport in Macedonia, the Ohrid Airport. 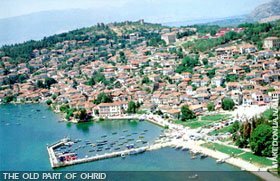 Ohrid, being a seat of a municipality has more than 52,000 citizens, mostly Macedonians and in little number Turks. Ohrid is visited by tourists during the whole year, but it's most visited during the summer months. Many foreign tourists all over the world are it's guests, while the majority of them are guests from Serbia & Montenegro, Greece, Bulgaria, Japan, China... The new, modern part of Ohrid, with the old part creates a synthesis between the past and the future. 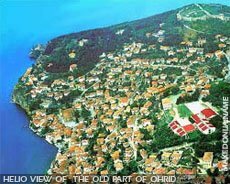 The Ohrid old part represents a citadel and contains many cultural-historical monuments that attracts the eyes of the tourists. Many people have already compared it, as the European Jerusalem. All the tourists can find accommodation in private houses or in the Ohrid hotels, cheap or expensive depending what they offer. All the hotels are located in the new part of Ohrid, while the most of the cafe-bars, night clubs and discothèques are in the old part of Ohrid. Also, there are hotels and camp sites, built in the surroundings of Ohrid, in the villages St. Stefan, Trpejca, Lagadin, Elsani, Pestani, Ljubanista and in St. Naum monastery complex (St. Naum is located 28 km from Ohrid, near the border with Albania). Here, most of the people go on beach in St. Stefan, Lagadin, Gradiste and St. Naum and also on the city beach Saraiste in Ohrid. 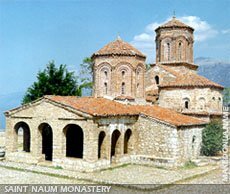 At the end of the 9th century and the beginning of the 10th century, due to the activity of Saints Clement and Naum of Ohrid, Ohrid was the oldest cultural temple in the world of the Slavs. There, they created the first Slavic University much earlier than the Bologna University, which was the first source of the Slavic literacy and culture. Towards the end of the 10th century, Ohrid became the centre of the first medieval state of Macedonian Slavs - under the reign of Samoil's. 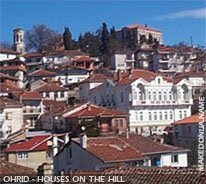 For a few centuries, Ohrid was the seat of the autocephalous Ohrid Archbishopric, until 1767, when the Ottoman Turks forbid it's work (the Ohrid Archbishop was restored 200 years later, in 1967 under the name Macedonian Orthodox Church). After the Balkan Wars (1912-1913), Ohrid became a city in the new Serbian kingdom. Later during the First world war (1914-1918), the line of Macedonian front was passing by the city and during the Second world war (1939-1945), Ohrid was occupied by the Bulgarian fascists. The artistic activity in Ohrid is included in the highest achievements of European art in this period. Ohrid and Ohrid lake, have both, since 1980, been under protectorate of UNESCO, as having universal, cultural, historical and natural value and significance. The tradition of Ohrid being a cultural centre, still lives today. Top names in art from all over the world gather in this city during the summer period. The Music-Scene Festival Ohrid Summer from 12 July to 20 August - a event held for 32 year now, includes guests from various different fields: directors, musicians, artists, writers, painters of world fame. At the beginning of the summer, the Balkan festival of songs and plays is held, with ensembles participating from the Balkan and other nearby countries. Each September, Ohrid is the host of the musical-folklore festival - Ohrid songs of the old city. 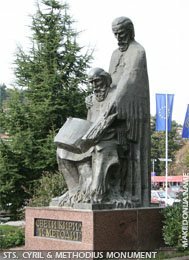 In honor of the famous poet Grigor Prlicev in April, there is the, Days of Prlicev event, and Macedonians from all over the world gather in August in Ohrid, for the seminar of the Macedonian Language, Literature and Culture. Church Saint Sophia - is one of the most important monuments, architecture and art from the middle ages. 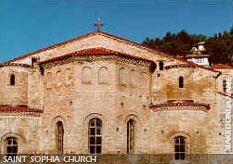 This church, was originally the synod church of the Ohrid Archbishop, and later converted to a mosque, has preserved in its interior the traces of several time-period: frescoes from the 11th, 12th and 13th century, which represent some of the most significant achievements in the Byzantine painting of that time. The main part of the church was built n the 11th century, while the external additions were built by the archbishop Grigorie in 14th century. Church Holy Mother of God Perivleptos (known as St. Clement) is located in the old part of Ohrid, near the Upper Gate. 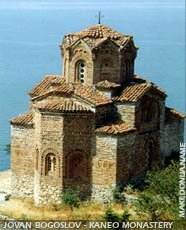 It is one of the most beautiful and oldest churches in Ohrid. It was built in 1295. The fresco painting in this church represent some of the first works of the most prestigious Macedonian icon-painters Michail and Eftihije. On the walls of this church, with extraordinary vitality and power, those two icon-painters have painted scenes from the life of Christ and the mother of God. 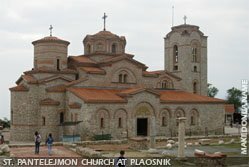 After the destruction of Clement's church St. Pantelejmon, the relics of St. Clement were transferred here, and ever since the citizens of Ohrid named the church St. Clement. 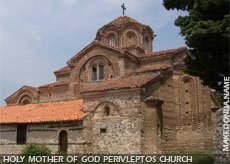 When the biggest church in Ohrid, St. Sophia, was transferred to a mosque, St. Holy Mother Perivleptos became synod Ohrid Archbishop. In this period, many church items, manuscripts, icons, books were transferred here, some of them preserved today. In this church is housed the most beautiful gallery of medieval icons, (numbering 30 in total). Each of these icons has high value and artistic quality. The monastery St. Jovan Bogoslov at Kaneo: A church dedicated to St. Jovan Bogoslov. There is written record of the time it was built, but it is believed that it originates from the 13th century. The donor and the icon-painter of the church are unknown. Significant to the architecture of the church is the exquisite combination of Byzantine and Armenian elements, which creates very favorable space for examining the medieval monuments in Ohrid. The fresco-painting for the most part is destroyed. Only the fragments of the altar fresco which present "Communition of the Apostles", the portrait of St. Clement, and St. Erazmo and Constantine Kavasilis have been preserved. The St. Pantelejmon church at Plaosnik: It was built in the 9th century by the city patron St. Clement (Sveti Kliment), over the bases of an older church. Proof of that is the basilica discovered by the archeological research. This church, that he built he dedicated to St. Pantelejmon. 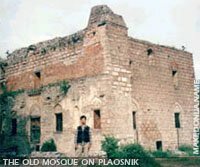 But, unfortunately the church was ruined by the Ottoman Turks, who built a mosque over it. The mosque existed until the year 2000, when it was demolished legally, in order of the renovation of St. Clement's church. The Fortress of Samoil: The Ohrid fortress is mentioned in descriptions in the chronicles dating from 476. Today's fortress relates to the name of Tzar Samoil, who probably extended and built the fortress when he chose it for his seat. It is the most monumental construction from this period. The fortress today has 18 towers and 4 gates. The central part of the fortress has wall 10 - 16 meters high and it has strong defensive towers, followed by ramparts in direction of the lake. The Old Bazaar of Ohrid: It is one of the most lively parts of the city, especially on the so called market days, where numerous customers, as well as food products, may also buy various handmade items. Especially interesting are the clay products, the old Macedonian musical instruments and the famous Macedonian embroidery. The church of St. Nikola Bolnicki: It is located near the lake shore. It was built in 1313. The painting on the walls of the church originate from several periods. Several are particularly noteworthy: "Falling Asleep of the Holy Mother of God", "Transfiguration of Christ", and "Entering into Jerusalem"; also the figures of St. Clement, St. Nikola and St. Pantelejmon, which are represented in life size, as well as the images of the holy warriors Theodor Tiron and Stralitat. The few icons in the church are also of special value, the most significant being the litian (religious procession) icon dedicated to St. Naum. The church of Holy Mother Bolnicka: It is located near the church of St. Nikola Bolnicki. The church yard is fenced with a high wall, and within the yard there are several tombs of monks or priors and the joint tomb of many citizens of Ohrid. There are several valuable icons and wooden iconostasis, carved, by master Nikola from Debar. The church of Holy Mother Zahumska: This church is located near the fisherman's village of Trpejca, some 20 km from Ohrid. The church represents a memorial of the founder Grgur, who built it in 1361. Although the painting has been damaged, the preserved parts show the excellent painting talent of the unknown painter, especially his sense of natural expression and coloring. The Ancient Theatre: This is a theatre from the Hellenistic and the roman period. 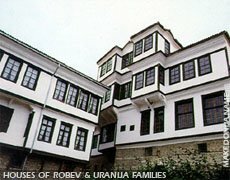 It is located in the ancient part of Ohrid, Varos, in the area of High Kale and Upper Saraj on Ilindenska street. The object is on 4000 square meters. The theatre is a place were many cultural manifestation are held, including the Ohrid Summer Festival, that is held here every year. Monastery St. Naum of Ohrid: This Monastery is not in Ohrid, but in it's surroundings. It's located only two kilometers near the border with Albania, on rocks and 28 km from the city. But we can say that is in the region of Ohrid that's way we mention it here. 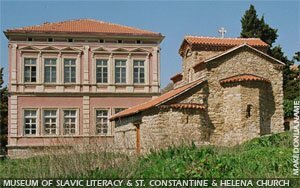 It was built by the monarch St. Naum of Ohrid a student of St. Cyril and Methodius and founder of the Ohrid literature school. Go inside and put your ear on his tomb, you can hear the sound of the water of lake Ohrid, beside you are 30 meters higher than the lake level. Today there is hotel complex St. Naum, which is separated between rooms for tourists and home of the priest.